Over 9 million bags of nuclear cleanup waste piled up across Fukushima Pref. The number of bags of waste from decontamination efforts around the stricken Fukushima No. 1 nuclear plant reached a little under 9.16 million as of the end of September according to Fukushima Prefecture and the Environment Ministry. The 1-cubic-meter bags are found at some 114,700 interim storage or decontamination sites across the prefecture. 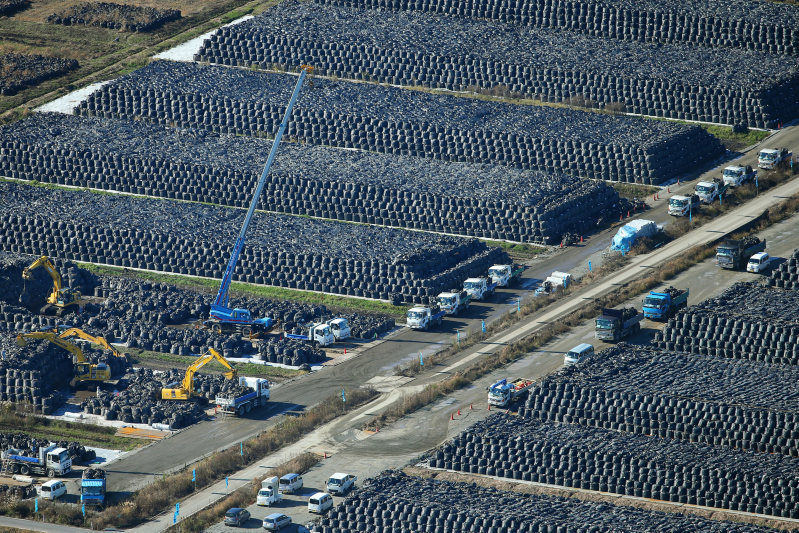 In the town of Tomioka -- covered by a nuclear disaster evacuation order -- mounds of bags have grown so tall that they obscure the power shovels used to move and stack the waste, the black balls covering every sliver of landscape. The bags of waste are typically stacked four layer high, with a fifth layer of uncontaminated soil laid on top to block radiation. Waterproof sheets are also used to stop rainwater from getting into the bags and becoming contaminated. Negotiations with the towns of Okuma and Futaba -- both under evacuation orders -- to establish mid-term waste storage facilities there have been hard-going, and the start of construction is nowhere in sight.